A century-old furniture store that stood vacant for nearly 30 years has been transformed into the modern, sustainable City of Jacksonville Jake M. Godbold City Hall Annex. TLC provided LEED® administration and enhanced commissioning services for the renovation project, which was awarded LEED Gold certification by the U.S. Green Building Council. 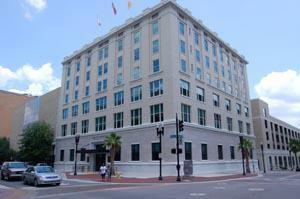 The six-story building houses the city’s Environmental and Compliance Department Director’s Office, Environmental Quality Division, Municipal Code and Compliance Division, and the General Employee Pension Office. In commissioning the building’s HVAC, electrical and water systems, TLC engineers confirmed that the systems were designed and constructed according to the owner’s vision and that facilities staff was instructed how to operate and maintain the systems. Our role also included reviewing the owner’s project requirements and the team’s basis of design; incorporating the commissioning requirements into the construction documents; developing a commissioning plan; and completing a summary commissioning report. • Light fixtures use reduced-mercury bulbs. Award by the City of Jacksonville and the Jacksonville Historic Preservation Commission. All above information provided by TLC Engineering.